The annual liturgy for Clergy Vow Renewal on Tuesday in Holy Week is a time of mutual support and spiritual rededication. It is a poignant moment for colleagues to be together, and I find preaching at this service to be one of the singular honors of serving as Bishop. Here is the sermon I delivered to our remarkable diocesan clergy this week. There is a trough in waves. A trough. A low spot, with waters rising on either side. A place where the horizon disappears. Where we can lose our way. Where, not seeing the horizon, we may sink from the grip of fear, or flail in disorientation. Such a trough is a place not only where the distant horizon may disappear, but a place also where even a nearby shore is out of sight, where the presence of other swimmers is lost to us. It is a place where naked loneliness takes hold. Where solitude suggests that nothing will happen that happens unless I make it happen. How we decried the declaration of the candidate: “I alone can fix it.” And yet how often do we fall into our own version of “I alone.” If I don’t do it, it won’t get done. I need to work harder. I need to figure this out. I alone must solve it; I alone resolve it. I’m the keystone in the arch; I alone must lead the charge. From this trough. Between the waves. This low and lonesome spot, from which the horizon has disappeared. But if we rest there in the trough, says the poet, keeping our energy and noticing the shape of things, the flow … will bring us to another place where we can see horizon, see the land again. The poem beckons to my own solitary soul as well. It points me not just to the strong and timeless cycle of Creation made manifest in wave and tide which will draw me forward by its rhythm. It points me also to the rise and fall of this week, this week of weeks, in which Christians find our truest path and deepest hope. Ebbs and flows, rising and falling, crest and trough. A triumphal entry into the Holy City; the crowd cheers; Jesus cleanses the temple. We’re on the crest. The next morning a hungry Jesus crankily curses a hapless fig tree for – apparently – failing to live up to its God-given potential. But haven’t we all thus failed? We’re in the trough. Time and again his opponents pose trick questions; time and again Jesus responds patiently with parables pointing towards the Greatest Commandment, the Law of Love. We’re on the crest. This loving instruction takes a turn. Denouncing the Scribes and Pharisees, Jesus excoriates them as hypocrites; blind fools; neglectful, greedy, lawless, self-indulgent, white-washed tombs; and children of hell. He predicts famines, earthquakes, a darkened sun, and gathering vultures. We’re in the trough. A woman comes to Jesus with precious ointment, bestowing upon him a moment of exquisite tenderness. Crest. Judas Iscariot: “What will you give me to betray him?” Chief Priests: “Thirty pieces of silver.” Trough. A precious, life-giving meal in a quiet upper room. Crest. Loneliness in the garden. Trough. Arrest in the darkness. Trough. Stripped. Mocked. Struck. Spat upon. Nailed. Trough, trough, trough, trough, trough. Pedestrians mowed down in Stockholm. Trough. Helpless victims asphyxiated with sarin gas in Syria. Trough. Coptic Christians bombed in their churches. Trough. In San Bernardino, another school shooting. Trough. There we may drown, says the poet, if we let fear hold us within its grip and shake us side to side, and leave us flailing, torn, disoriented. But, continues the poet, if we rest there in the trough, in silence, being with the low part of the wave, … noticing the shape of things, [then will we be brought] to another place where we can see horizon, see the land again, regain our sense of where we are, and where we need to swim. This, after all, is the core of our week. This is the arc of the Triduum for which we are heading. This is Jesus’s own summary of trough and crest, of falling and rising again, of dying only to live more fully. To which, of course, we might add: That is why the cross is a symbol of victory, and that is why this Friday is Good. 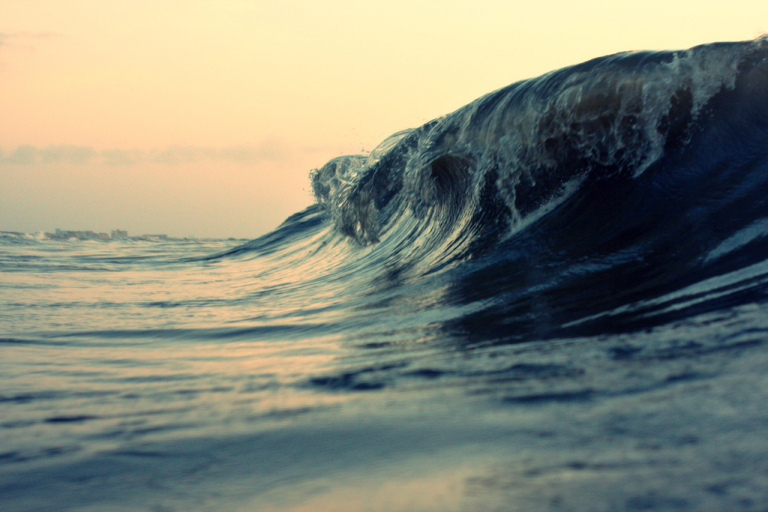 Dear friends: Sometimes, by God’s Spirit, we find ourselves on the crest, buoyed by a wave of grace. At moments the horizon towards which we are called is bright, and beckons with renewed clarity. At moments we glimpse fellow swimmers and are filled with gratitude. At other times we are, without doubt, swimming in the trough. Waves rising on either side. A horizon lowered out of sight. I for one can say that I never welcomed the season of Lent as fully as I welcomed it this year. For it seemed to me that when we arrived at Ash Wednesday the world around us had already been there for some time: solemn, ashen, with ample cause for repentance, and chanting an existential Kyrie: Lord, have mercy upon us. For our liturgical season to be aligned with that sense of the world has been, for me, a gift. A gift of integration, and of renewed hope for the depth with which we will claim our Easter joy. Amongst our clergy colleagues, some of you have told me that you are on the crest. Some of you have told me that you are in the trough. Some of you have found renewed purpose and clarity in your vocation. Some of you are struggling to find your vocational footing in a changing world. Some of you have recently found new love. Some of you have recently lost a loved one. Some of you have received a scorch-o-gram, accusing you (or your bishop) of being “too political.” Some of you have received an epistle of regret, lamenting that you (or your bishop) have been “too tepid.” Some of you have received both such memoranda on the same day, leaving you to conclude that (a) you just can’t win for losing; or (b) you must be landing pretty close since you are getting it from both directions; or (c) you truly want to love them all, every one; or (d) all of the above. Of course, it’s (d). We win, we lose, we get it right, we get it wrong, we strive as best we can. And we love them all, by God’s grace, because we all have been loved, just so, by him who died for us. My dear companions, colleagues in holy orders, and fellow swimmers: I hope that you yet love what you do. I hope that you know how much God loves you for what you do. I hope that you will find that moment to rest in silence, to glimpse anew that land towards which we swim together. I hope that you will find, in renewing your vows this day, a renewed measure of determination and grace. [i] Judy Brown in Leading from Within: Poetry that Sustains the Courage to Lead, Sam Intrator and Megan Scribner, eds. (San Francisco: Jossey-Bass/Wiley Imprint, 2007), p. 61. [iv] Jonathan Sacks, Not In God’s Name: Confronting Religious Violence (NYC: Schocken Books, 2015), p. 236. Wave image used under Creative Commons License via Flickr.